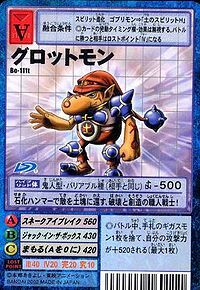 A Digimon that possesses power over Earth which bears the might of one of the legendary Warrior Ten. Various weapons and armor are brought to life from its large hands and thick fingers, and its craftsmanship is practical yet artistic. 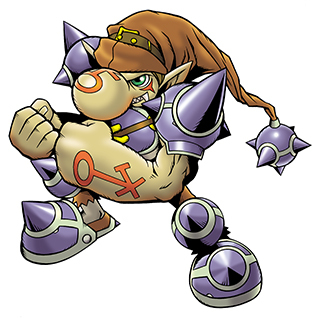 The Grotte Armor that it wears and its main weapon, the Grotte Hammer, are both the handmade Grotte-brand. It prefers to act alone since it hates being ordered about, however its artisan pride is such that once it recognizes someone's true merit, it will obediently abide them, and immerse itself in its own work. 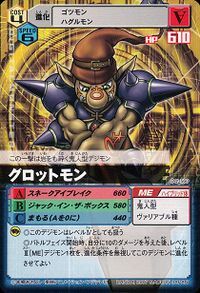 Although it's not very intelligent, its pride towards its work is intensely high and it has a strong tendency to take the opponent lightly. In battle, it mainly petrifies enemies touched by its Grotte Hammer and then destroys them (Snake Eye Break), and burrows into the ground and ambushes the opponent from beneath their feet (Jack in the Box), but, in fact, it also has a technique which creates Golemon using the earth around it and orders them to attack. 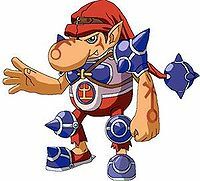 A Digimon that possesses power over Earth which bears the might of one of the legendary Warrior Ten. Various weapons and armor are brought to life from its large hands and thick fingers, and its craftsmanship is practical yet artistic. 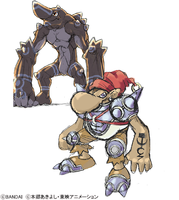 The Grotte Armor that it wears and its main weapon, the Grotte Hammer, are both the handmade Grotte-brand. It prefers to act alone since it hates being ordered about, however its artisan pride is such that once it recognizes someone's true merit, it will obediently abide them, and immerse itself in its own work. 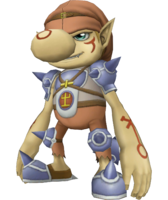 Although it's not very intelligent, its pride towards its work is intensely high and it has a strong tendency to take the opponent lightly. In battle, it petrifies enemies touched by its Grotte Hammer and then destroys them (Snake Eye Break). 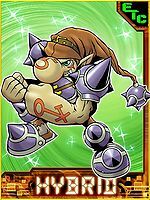 Title: 「土の人闘士」 — "Human Warrior of Earth"
n., Grotte 「グロット Gurotto」 means "grotto". v., Grumble means to murmur or mutter in discontent. Anime/Manga Digimon Frontier: "Thunder Power Shaking the Ground, Blitzmon!" 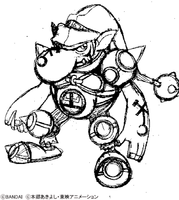 Snake Eye Break  スネークアイブレイク Sunēku Ai Bureiku Seismic Sledge Summons one or more of its flexible Grotte Hammers from the ground or its armor and hits the enemy with them. The attack can be used to petrify and smash enemies. 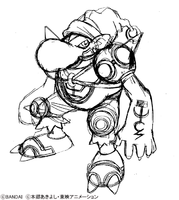 Jumps out of the ground and attacks with its Grotte Hammer. Grottemon is one of the Legendary Warriors siding with Cherubimon. Grottemon is only obtainable as a collectible card. 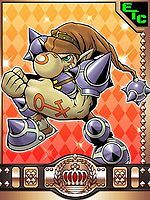 Its card is part of the Five Evil Warriors (悪の五闘士 Aku no Gotoushi) set. 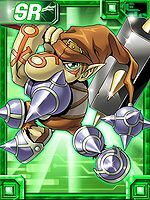 Grottemon is available as a Digimon Medal. An expert at making weapons and armor! A chunky warrior of the earth!! This battle craftman's equipment is all hand-made Grotto Brand! 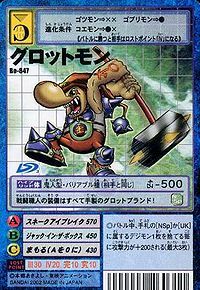 It uses its stone hammer to return its opponents to the earth, the craftsman warrior of destruction and creation! 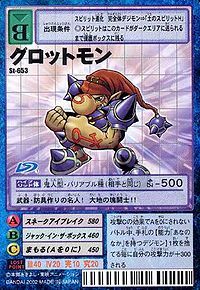 One strike from this Oni Digimon can smash even boulders. ↑ Digimon Frontier: "The Five Legendary Warriors VS The New Warrior!" This page was last modified on 26 March 2019, at 10:29.